"Why Do People Who Practice the Law of Attraction Rarely Manifest Their Desires?" illions of people have been seduced by the lure of the Law of Attraction and its promise of manifesting wealth, health and all the good things in life. However, the practice of the Law of Attraction as it is currently taught yields disappointing -- or even harmful -- results. A new book corrects the inaccuracies, points out hidden dangers, and dispels the myths surrounding the Law of Attraction. More importantly, it sheds light on the most powerful manifestation principle that no one is talking about. When you combine this principle with your practice of the Law of Attraction, you enter the realm of miracles where your desires can and MUST necessarily manifest into existence. "One of the best books written about the Law of Attraction -- really a masterpiece." "Awesome read!!! I've spent the last few years reading all the books written about the Law of Attraction and this gem of a book fills in all the gaps that so many of the others leave out. It's a simple read -- took me a few hours, but don't underestimate its simplicity. The author's fascination with the Law of Attraction, quantum field and intention to manifestation principle really comes through. The popularity of the Law of Attraction has reached fever pitch ever since the 2006 release of the video titled, The Secret (and the book of the same title), as well as the publication of recent bestselling book titles such as Ask and It is Given, Excuse Me Your Life is Waiting, The Amazing Power of Deliberate Intent, and The Law of Attraction. The concepts currently propagated by Law of Attraction aficionados -- such as visualization of desires, and gratitude for what one has -- are useful and important. But while the prevailing teachings of the Law of Attraction provide positive benefits -- such as getting you to focus on positive things, visualize the things you want, eliminate any victim attitude, and take charge of your thoughts -- there is also a downside. aw of Attraction concepts, the way they are currently taught, mislead people into believing that the universe is like a cosmic restaurant that takes your orders (desires) and delivers them to you just as surely as a waiter takes your orders and delivers food to your table. This is certainly an exercise in delusion. 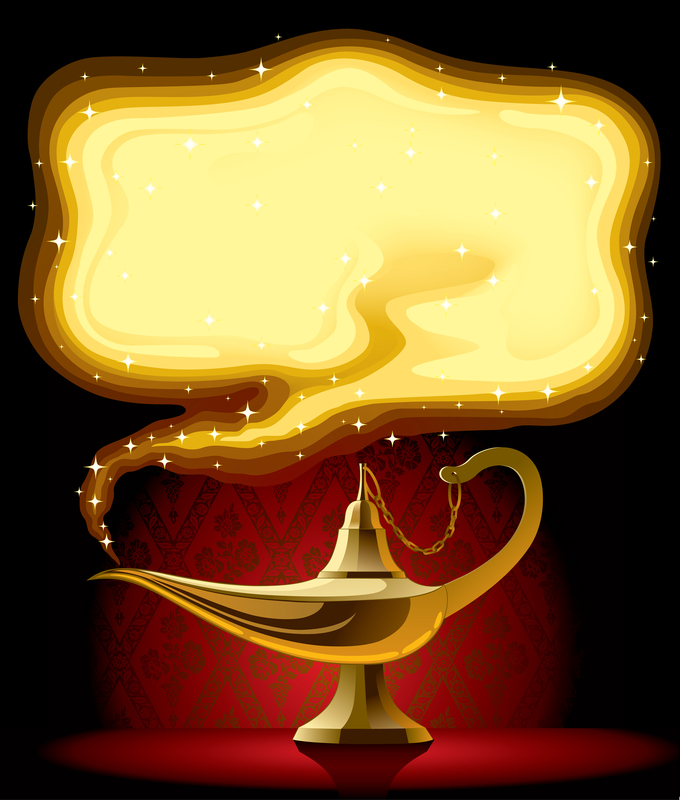 Neither is the universe a magic genie that grants your every wish (as depicted in The Secret DVD). That's not how the principles of the Law of Attraction work. In an interview with Newsweek, Fred Alan Wolf, a quantum physicist who was a featured "teacher" in The Secret admits that this is not the way manifestation works. Another quantum physicist, John Hagelin, also a "teacher" on the DVD, states, "The coherence and effectiveness of our thinking is crucial to our success in life ... but this is not, principally, the result of magic." "I've read this book 4 times -- truly powerful!" "I've been studying the Law of Attraction for about a year, and when I encountered The Greatest Manifestation Principle in the World, it made so much sense and I truly enjoyed reading it -- and I've read it 4 times in the last few weeks. Upon looking back on the successes of my life, I find that the greatest manifestation principle which this book talks about WAS the underlying factor. While it is certainly possible to manifest one's desires from their unformed state to actuality, it cannot be done by using the methodology suggested by the current crop of books, DVDs and resources. Case in point: Law of Attraction aficionados often quote the book, The Science of Getting Rich (written by Wallace Wattles in 1910), which states that when one practices the principles of the Law, "Failure is impossible." Yet, when one surveys Law of Attraction practitioners, it becomes apparent that for every individual that has reportedly succeeded in manifesting their desire using the current methodology of the Law of Attraction, there are at least 1,000 who have not manifested their desire into their lives. That is a 0.1% success rate -- or conversely, a 99.9% failure rate! Certainly a far cry from "Failure is impossible," isn't it? Go ahead and do a random survey on your own -- and you will discover the same dismal results. You will also find that in the case of the one practitioner (out of 1,000) who has successfully manifested desires into existence -- such as those featured in "The Secret" DVD -- the positive result usually had nothing to do with the Law of Attraction at all. It was most likely caused by confirmation bias, the experimenter effect or inspiration -- not the attraction factor. Does that mean that the Law of Attraction is nothing but a hoax? The Hit-Or-Miss Methodology Does Not Work! t simply means that the hit-or-miss methodology being taught in the current body of knowledge is insufficient for manifesting desires into existence. It produces an overwhelming number of misses compared to hits. You could spend years trying to manifest your desires using the current methodology -- and eventually become disillusioned when your desires do not materialize. The good news is that there is a "missing secret" behind the practice of the Law of Attraction that no one is talking about. When this "missing secret" (referred to as the greatest manifestation principle in the world by author, Carnelian Sage) -- is combined with the Law of Attraction, it completes the recipe for manifestation. Therefore, your desires can and must necessarily manifest into existence. Individuals of great accomplishment throughout human history have invariably aligned themselves with this manifestation principle. The same is true of individuals who have been miraculously healed of lingering -- and even terminal -- illnesses. Somewhere along the way, they hooked up with the greatest manifestation principle usually without knowing it -- and that principle is what caused the desire to materialize. Conversely, individuals who fail to manifest their desires are unsuccessful because they do not activate the power of this manifestation principle. Visualizing and affirming your desires without adding the manifestation principle to the equation is akin to building a rocket that does not have sufficient propulsion to catapult it into space. Even if you focused on what you wanted 24/7 -- took your focus away from the things you don't want, visualized your desire vividly, and expressed gratitude every step of the way -- you would still fail to take your desires from formless to concrete expression. That is because this popular ask-believe-receive "formula" for manifesting desires -- even though it is supposedly supported by quantum physics and Scripture -- is not what causes desires to manifest. And yet, this is the way the majority of people go about trying to manifest their desires. This is also why in over 100 years that the Law of Attraction has been in the public eye, there has never been any degree of consistency or certainty when it comes to getting results with its use. The Greatest Manifestation Principle in the World is the first book that removes the blindfold from the world's current understanding of the Law of Attraction -- and reveals the true power behind it so that people can finally experience spectacular and consistent results from it. Now, you can make the manifestation of your desires a certainty, instead of something merely hoped for. When you learn the greatest manifestation principle in the world, you will . . .
. . . and enter the realm where miracles become everyday occurrences. This first-of-its-kind book features a simple, easy-to-follow blueprint that enables you to apply the greatest manifestation principle into your daily life. The blueprint takes only 5 minutes a day (or less) to do -- and after consistent practice, the manifestation of your desires becomes automatic. "This book blew me away ... it's divinely inspired!" "I have read a LOT of material about the Law of Attraction. I've even taken classes to become a Law of Attraction practitioner. And yet I still learned so much from The Greatest Manifestation Principle in the World. I could not put it down. I was so blown away by this profound book! It is so well written that I'm convinced it's divinely inspired. It is elegant in its simplicity, and it addresses the 'elephant in the room,' namely what everyone is thinking, but no one is bold enough to say out loud -- "I believe in the Law of Attraction, I've been using it, but IT'S JUST NOT WORKING FOR ME! "I've read all the books that have come out in recent years about the Law of Attraction -- including The Secret, Excuse Me Your Life is Waiting, Ask and It is Given and The Amazing Power of Deliberate Intent. I've focused on my intentions, vibrated my blissed-out, grateful feelings out into the universe, gotten into inspired action and practiced all the Law of Attraction principles -- but I've only gotten erratic, inconsistent and unsatisfying results. "I don't mean to debunk the Law of Attraction, but I had begun to feel there's definitely something missing. After all, if the Law of Attraction is indeed a universal law, it should deliver consistent, predictable results. The fact is, I've rarely met people who've achieved their desires by practicing the Law of Attraction. Then I came upon this jewel of a book titled The Greatest Manifestation Principle in the World. This book really gets to the heart of the matter -- and delves into the fundamental cornerstone of co-creation and manifestation. Then, it gives a simple exercise that takes only a few minutes to do, and enables you to practice the principle in your daily life. "It works every time without fail !!!" "A must-have and a must-read book"
"An inspiring book that will stun you!" Fairy Godmother approach! I highly recommend it." 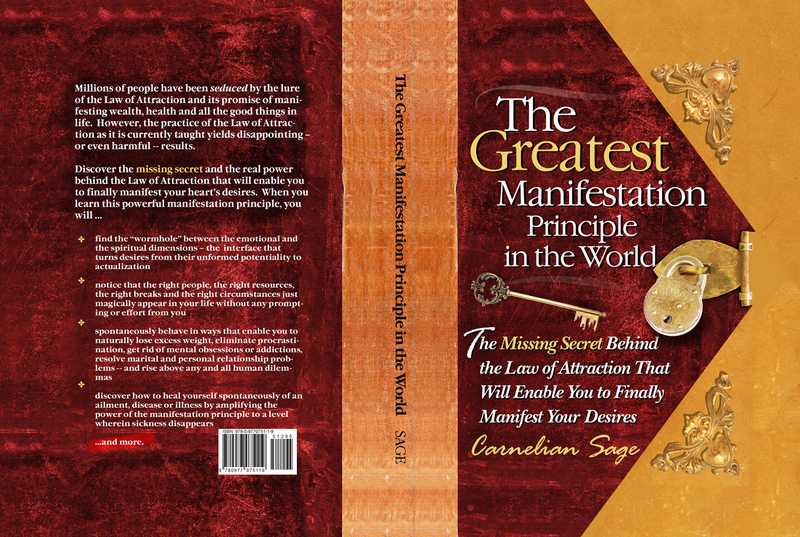 "I read The Greatest Manifestation Principle in the World last night in one sitting. I couldn't put it down. 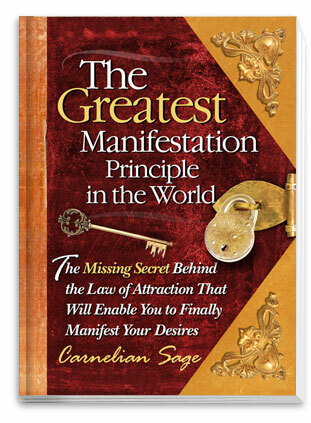 Having watched The Secret video and read books about turning thoughts into things, all the way back to Napoleon Hill's Think and Grow Rich, I'm fairly familiar with the subject of manifestation, although I must admit I have not researched it to the degree that Carnelian Sage has. Like the author, I have found myself uncomfortable with the Fairy Godmother approach to manifestation that the other books have suggested. I found this book to be refreshing because, among other things, it points to divinity (or God) as the actual source of all things, and we human beings are co-creators. "Makes Your Life Richer and More Beautiful"
"This book is by far the BEST manifestation book ... this is the missing piece"
Click here to read more rave reviews. Chapter 1: Is the Law of Attraction a Hoax or a Real Treasure? magine how your life would be if you could manifest all your desires into existence. What if all you had to do was wish for a loving relationship, an ideal job, perfect health, your dream house, a luxurious vacation, a brand new car -- or anything you want -- and it magically materialized in your life? This is the promise of the Law of Attraction. That is why millions of people have been seduced by its lure -- and have devoured books, DVDs and courses that promise to show them how to use this "scientific law" that can bring wealth, health and all the good things in life. Perhaps the question you need to ask is this: Have you -- or anyone you know -- actually seen the amazing results that you are supposed to be getting in your life by practicing the principles of the Law of Attraction as it is currently taught? Have you acquired the new car and the beautiful house, achieved abundant wealth or been healed of an incurable disease -- or are you one of the majority who has learned to patiently wait for your desires to manifest? If so, be prepared for a long wait. If, on the other hand, you'd like to discover the missing secret and the real power behind the Law of Attraction that will enable you to truly manifest all your heart's desires, you�ll find the answer in this book. In the latter part of this chapter, I'll show you . . .
. . . why no one is talking about this principle until now. There is an infinite field of energy that surrounds and permeates all things, embodying all existence, both seen and unseen. Some call this energy field Source Energy, the quantum field, divine intelligence, the universal mind, the field of all possibilities -- or its ultimate name, God. This field is without beginning or end, goes beyond time and space, and consists of pure boundless, immeasurable power and energy, vibrating higher and faster than the ordinary levels of human intellect and awareness can observe, comprehend or explain. In this formless vibratory spiritual field of Infinite Potentiality lie all the hopes and dreams of all mankind -- where all your desires are already an unformed potentiality waiting to manifest into existence. All human beings exist within this field, are part of it, and are connected to it -- but most of us have lost our natural connection to it because of the emergence of the ego. The ego is your false self, an illusory idea that you construct in your consciousness about who and what you are. It is your ego that keeps you separate from this field, and makes you unable to access the field's power to bring you what you desire. he greatest manifestation principle in the world that is revealed in this book will enable you to realign yourself and stay in harmony with this field where all things are possible. I invite you to read this book repeatedly and often. Simply reading a chapter, a page or even a paragraph from this book everyday will have a transformational effect. It will make you a different person and will have a profound impact on your energy level and personal growth. As you read and reflect on the material contained herein, layers of wisdom and insights will unfold that will accelerate your ability to effortlessly attract the things you really want. When you allow the power of the greatest manifestation principle in the world to permeate your awareness, amazing things will begin to manifest in every area of your life. It is my hope that this book spares you of the disillusionment and disappointment you might experience as you practice the Law of Attraction the way it is currently being taught. May the spiritual truth and the expansive way of seeing things that you will discover in this book enable you not only to manifest your desires but allow you to find unbounded joy, love and peace in your life's journey.